Microfiber tights with classic argyle pattern. Great for pairing with shorts! These tights have flat seams, male front panel, no fly opening, reinforced toes. The pattern goes all the way to the waistband. Colors: black/gray tights - black, dark gray and light gray; marine/gray tights - dark blue, dark gray and light gray colors. 5&apos;7" - 5&apos;11" 5&apos;9" - 6&apos;2" 5&apos;11" - 6&apos;4"
Microfiber tights with classic argyle pattern. Great for pairing with shorts! 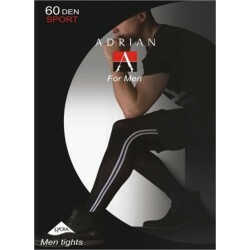 These tights have flat seams, male front panel without fly opening, reinforced toes. The pattern goes all the way to the waistband. The color variations are as follows: black/gray tights - black, dark gray and light gray; marine/gray tights - dark blue, dark gray and light gray colors. The sizing chart was accurate for me, and at 60 Den. the tights were pretty durable. The look and feel of the tights was very good as well. I appreciate the male comfort panel as this added to a higher level of comfort. The only reason for a 4 star rating is because after a 14 hour day the pattern around my thighs began to fray. Otherwise a very nice pair of tights.